Starting your research in Summon is great because materials from throughout the library are being searched from the single search box. A search on cat dog fish will retrieve items that contain all three words in the citation and/or in the full text of the item. Refining your search to get the best material for your research can also be done by adding more keywords to your search. Just like searching the open web, you can indicate a phrase by putting quotation marks around the words. The query "teacher education" will find results with that phrase. Wanting to do a more targeted search? Moving over to the Advanced Search page lets you be more specific with your search. For example, you can tell Summon to look for the author "Sally Smith", so you can focus your search on materials by "Sally Smith" rather than about "Sally Smith". Click on the Advanced link to the right of the keyword search box to go to Advanced Search. 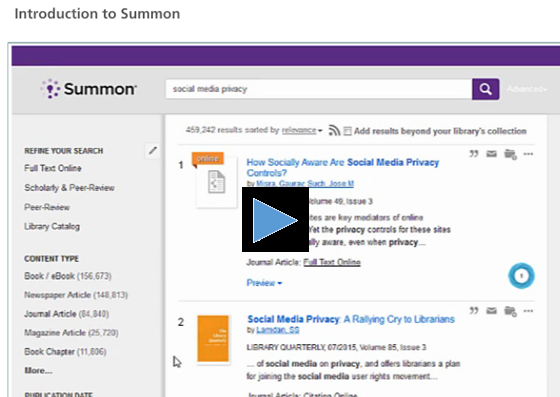 Are you ready to start using the Summon service to do research at your library? This video will explain the basics of searching for content, refining the results using facets and filters, accessing content, and saving citations. Your library’s Summon interface will look somewhat different than this, but the tools and features are common to the Summon service at most libraries. Try going beyond the basics in Summon. The Summon service contains billions of citations, and when you do a search in the basic Summon search box, you may get more results than you can easily work with. That’s why the Advanced Search tool is so powerful: You can customize the search to discover certain keywords in specific metadata fields (like author, or subject), filter out content types you don’t need, and much more. Having trouble identifying your research topic? Not able to contact a librarian at the moment and having trouble defining your research topic? Are you an instructor? Or maybe you're a graduate student conducting long-term research? You can create a search box or a search widget that is scoped to your particular needs, and place it on any webpage. For example, if you are a Physics instructor with a course webpage, you might want to promote the diverse world of physics-related research by providing a widget or search box that is automatically limited to querying physics-related material. Several other scoping mechanisms are available, check them out at http://MyDomain.summon. serialssolutions.com/widgets, replacing "MyDomain" with your library name as it appears in the URL for the Summon search results page.